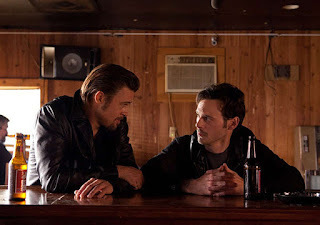 A grim gangster flick, Killing Them Softly has an overabundance of gab, some flair and insufficient substance. It's 2008, and the great recession is creating economic chaos. 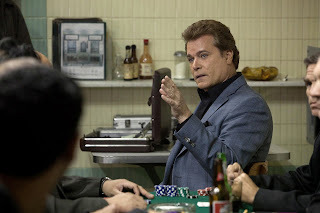 Against a backdrop of politicians trying to bail out the financial sector and the looming presidential election campaign, low-level gang boss Johnny "Squirrel" Amato (Vincent Curatola) hires young thugs Frankie (Scoot McNairy) and Russell (Ben Mendelsohn) to rob an illegal large-stakes poker game hosted by mobster Markie Trattman (Ray Liotta). Australian Russell is an unreliable heroin addict and dog snatcher, but Squirrel believes that they can get away with the crime because suspicion for organizing the theft will immediately fall on Markie himself, who has admitted masterminding a previous similar heist. The robbery is committed, and the Mob uses Driver (Richard Jenkins) as a go-between to hire hitman Jackie Cogan (Brad Pitt) to dish out revenge. At first it appears as through Markie is indeed considered the principle suspect, but news filters back to Cogan about the involvement of Squirrel, Frankie and Russell. Cogan recruits fellow assassin Mickey (James Gandolfini) for extra firepower, but Mickey has issues of his own. Written and directed by Andrew Dominik, Killing Them Softly aims for a hip Tarantino-like vibe, and generally fails. The mixture of long conversations, incessant profanity and short scenes of gory action is fundamentally unbalanced. The characters never come close to achieving the requisite level of likability to make the film work, and the tension remains at a flaccid level. The one element that does intermittently relieve the tedium is the film's visual style. In-between all the talking Dominik and his cinematogapher Greig Fraser compose some memorable scenes, using sharp framing and ominous urban decay as a visual representation of the collapsing financial sector. The background soundtrack includes a steady stream of sound clips from President Bush reacting to the crisis and candidate Barack Obama electioneering. Their words serve as jolting reminders of how close the world's economy came to the brink and how effectively Obama's idyllic promises of a new hope lifted spirits. Nevertheless, the connection to the film's story of criminals living in a world of their own is both too obvious and completely irrelevant. The scenes of violence are few, but are executed with panache, a cold detachment and an excess of blood and broken bones. With the f-bomb dropped every other word, Dominik confuses excess with impact. Brad Pitt cruises through the film with a general sense of disinterest, Jackie Cogan bordering on a secondary presence. Frankie and Russell are the two most prominent characters and both hoodlums are far from capable of carrying this or any other film. James Gandolfini suffers most from the film's lack of punch: hitman Mickey burns up an inordinate amount of time, most of it invested in exceedingly tedious stories as he drinks and whores his way to inconsequence. Much like the movie itself, Mickey is overinflated with boring talk and can't deliver when it matters.